Ranger Steve is a mass shooting made powered by IO games. Previously, you might have played battle combat games by IO such as Lords.io and ManOrMonster. 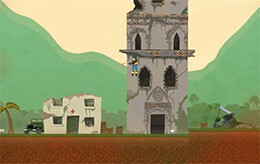 This time you are the Ranger Steve in the game to fight the bad guys. The game started off with a character who is well dressed in a pant and shirt, he is known to be the “Ranger Steve”. There are block and building you can jump over to. Collect weapons when you are moving around the arena. There are other soldiers as well, playing solo, so you have to attack them and keep yourself safe. Make sure you get a weapon as soon as possible or it won’t take long for anyone to kill you. The game is a one-time game, so if you get killed it will start over from the beginning. Also, do not jump in the green poisonous water, as your ranger Steve will die in an instant in that water as the base. This game is very addictive and fun to play. Those who are fond of guns will love to play it. The game has to be played using the mouse of your PC or computer and as well as a keyboard. Use your mouse to aim at other soldier and click left to shoot the gun. To fly around right click your mouse. Moreover, to move your ranger use the keys “W, D, A”. To change your current weapon scroll our mouse wheel or press the number keys 1 to 0.